I have posted a similar post before but wanting peoples opinions. I am keen to get into professional climbing and adventure photography. so looking for professional cameras. I was looking at the Nikon D500 or the Z6, but then there's mirrorless like the Sony a7iii needing help currently use Nikon mid range DSLR but wanting high quality under £2500 for body then invest in lens. Depends what you want to do with it- everything is a compromise between weight /cost/ image quality. Sony A7 series is good. Hi Dan I'd often be shooting whilst on rope so jumaring up shooting action and then showing scale of climbs within the landscape. I would be using the camera for landscape photography and climbing photography. Also have a good look at how robust you want your camera to be. My Canon 5Diii was definitely more robust then my Sony A7R3, but the sony is just smaller, lighter, has better video and more dynamic range then the canon. I have no experience with the new mirrorless Canon R and Nikon Z range, but I would shure take a good look at those; they might be a step up in robustness (weathersealing?!) and/or specs from sony. Other options would be Fuji/Panasonic/Lumix mirrorless. Small note on the sony a7 range: I have the a7rIII, for photography, a7sII for video. Though I think the A7III is a cheaper and better option for almost most cases at the moment. There isn't a 'best camera', just get the one that feels best in your hand and most intuitive to use. It's unlikely you'll ever be taking anything as iconic as Herford sat on top of the Great Flake and that camera would have needed a fair bit of hauling back in the day, indeed in the right hands it could still take a world class photograph today. I say this as a professional photographer. The camera body will have some effect, but mostly it's the lens. How ever, one way of looking at this is what kind of angles you're looking for. If you want to use wide angles (like shooting close to boulderers or whilst hanging on the rope with the climber really close), then you should look for full frame (or greater) bodies. As wider selection of wideangle lenses available and less distorsion on the wider end. If you plan on shooting more telelenses, then crop bodies make more sense as the effective fov makes the lenses *longer*. So smaller bodies & lenses with greater *reach*. For landscape, that are generally shot mild wide angle to normal lenses, both crop and FF (and greater) offer these. And as mentioned, robustness, size and lens selection also affect the choice. Oh and budget. I use a Nikon D810 but the kit is quite bulky and heavy and once the z system beds in I will probably move over. the other option is the Fuji XT 3 good lenses good weather sealing etc. be aware that Nikon are moving pro lenses into full frame so longer term your going to find pro Nikon apc lenses in short supply (at the wider end) especially with the new z mount lenses on the way. I use a Fuji X-T3 with a variety of Fuji lenses. The X-T3 is a superb camera which shoots good video as well as stills. The lenses are fantastic. The 16-55mm and the 50-140mm are my 'go to' lenses most days. They are solid bits of kit having metal bodies but that means they can take a lot of abuse when shooting in challenging environments. I know it's a cliche but the best camera you can have is the one that you always have with you. I now use a M4/3s sensor in an Oly OMD EM1 mk2...it is also rated to -10C & is quite water (splash) & dust proof, & more so than the others listed above. I'd love to know why I got dislikes on this. Ultimately today's low light sensor and auto focus technology is not going to be tested by climbing or landscape photography. The output file is not going to be noticeably different in any camera utilising equivalent lenses - it's certainly not going to be the deciding factor as to whether or not you win a commission. Therefore all that's left to discern the models is the build quality and usability which is what I pointed at in my post. Which feels best in your hand and most intuitive to use. Folk with big hands might (and do) find the smaller mirrorless models too fiddly, and would opt for a larger dSLR just for the size.. and so on. If it was for the blasé attitude to not taking iconic photographs - well I've taken photos of everything from Sunday league to UEFA Champions League finals and I've seen cracking pics of 'iconic' moments taken with entry to mid level dSLRs with 'cheap' lenses on the front. I've also seen bloody awful pics taken with 1DX and 400 2.8s... so even if you do end up taking the next picture that still sees the light of day in 100 years time, it'll be your talent that makes it and not the fact you bought a Nikon over a Fuji. Micro four thirds you say? To clarify, are you wanting to photograph professional climbers and adventure, or do you want to BE a professional photographer of climbers and adventure? For the latter, I saw a great reply somewhere else along the lines of "Unless you're Keith Ladzinski- you won't". Climbing is too small an industry to support such a niche photography topic full time. "Adventure" is broader, but melds into travel, which is a massively over-saturated market. Eddie who shoots the IFSC world cup series does it unpaid, relying on Patreon to fund him as far as I'm aware. >so looking for professional cameras. That being said, full frame is pretty useful as it does things crop-bodies can't, but not really vice-versa. If you're looking at Sony A7/9r's - the amount you can crop and still get massive images is insane. Weatherproofing would be pretty essential which is where Sony's tend to fall short, but you can get covers which mitigate against the worst. More generally, it's the lenses that will open up photography more than the body. In this area, Canon/Nikon have a much wider and cheaper range of lenses, and there's a much larger market for second-hand lenses. Sony lenses are noticeably more pricey than their Canikon equivalent and it's generally harder to find a used bargain (which I can attest to as a long term A7R2 user). Sigma are slowly entering the FE mount world, but at the top-end. Tamron I think have said they're releasing some native FE stuff, but nothing yet. Yet both Sigma/Tamrom offer great lenses for Canikon for less than their Canikon equivalent. I have spent a ton of time researching this topic recently. I travel full-time and have used a variety of cameras. Mirrorless are generally less weight and bulk than a DSLR, but the lens will often be just as bulky. Sony (+ others) now has a wide range of lenses available for the E-mount, including some useful focal lengths for landscapes/climbing. Nikon's Z6 and Z7 are comparable to a Sony A7iii or A7Riii respectively on paper but don't have as many lens options at the moment. Regarding weather sealing, Jonathan Griffith uses (or used) Sony Alpha series, so it is probably up to the job, although the Nikons and most DSLRs do fare better in this regard. As others have said, Micro 4/3s is another option if you want to go lighter/more compact. If you already have Nikon glass I would probably get an adapter and the Z6 or Z7. If you don't have decent lenses, invest more in them than the body. FWIW, I was climbing with an Olympus EM-5 but am now looking to move to a Sony A7Riii. Lenses are a Zeiss 18 F2.8 (nice compact lens), Tamron 28-70 F2.8 and an F1.8 portrait lens for travelling. On hard climbs, I will take an APS-C Sony A6000 with the Tamron instead of the A7Riii. The most important thing for climbing with the camera is that you have an accessible, secure carrying system (e.g on your harness, not in your sack). Second most important thing, insure your gear! I would normally recommend the Sony cameras but the Z6's superior weather proofing makes it a winner, definitely. > I have spent a ton of time researching this topic recently. I travel full-time and have used a variety of cameras. Mirrorless are generally less weight and bulk than a DSLR, but the lens will often be just as bulky. Hmm I have not found that to be the case with my micro four thirds camera. I used to own a Nikon dslr with a crop sensor. My walk-around lens was a Sigma 17-70mm 2.8 and for me that lens was big and heavy. My current 4/3 camera has an equivalent lens of 12-35mm 2.8 and its a fraction of the size and weight. Now if you wanted to compare my 100-400mm lens which I can used single handed against a full frame equivalent, I would probably need a tripod to get good results. And even though the lenses are made by Panasonic, they are designed to Leica specs, to which Leica are fully involved in the design process. For a punter such as myself this is way above my expectations on how sharp and light glass can be, and my neck is thankful for weight reduction. As do many other branches of photography, the current crop of sensors from all manufacturers will provide more than what most people will require - certainly a vast improvement to what you’ll have had in even the pro cameras just 6 or 7 years ago. Climbers tend to be largely static subjects, quite the difference between them and Ronaldo blasting down the wing under floodlights or having to pick out the one goalscorer amongst a potential four or five in a split second, I’m sure you’ll agree. Added to that the fact that most climbing imagery is quite environmental, I imagine a lot is shot with a wide depth of field which means the relatively small change in position climbers make with each move will have little in the way of effect on the sharpness regardless of where the focus is set.. let’s face it, full on dynos are rare as it is.. pictures of them even less so. I should point out I mean full frame mirrorless setups here (like a Z6 or an A7iii). For sure the micro 4/3s will be a more compact setup than almost any full frame setup, except perhaps some sort of pancake lens. A lot of the full frame mirrorless setups end up being a similar size to a DSLR setup due to the lenses, and possibly similar weight when extra batteries are factored in. I think the limited number of native lens options for the Z6 does counteract the better weather proofing a little. For example, the only UW option is the 14-30mm f4, which should be great for most landscape/mountain work, except perhaps astrophotography. It looks like there are some good options coming out this year though (e.g. 24-70mm f2.8 & 24mm f1.8). I might have to reconsider! Make sure you know what sort of lenses you want before committing to a system as this is often more important than the body itself. > If you plan on shooting more telelenses, then crop bodies make more sense as the effective fov makes the lenses *longer*. So smaller bodies & lenses with greater *reach*. just on this point - assuming a 200mm lens on a M43 body vs an APS-c body - the conversion factors would suggest that being about 400mm equiv in the M43 and 300mm for the APS-c. Yes. But you can also crop From the MFT. So simply talking about FOV, MFT systems end up being smaller/lighter than crop set, and greatly smaller than fullframe stuff (with or without mirrors). oh, If the OP is not in a hurry and can wait a month or so. The new Panasonic FF mirrorless will be available, and to me they seem to be better than Nikon Z6/7. And as they use an existing mount, lenses are available (Granted Leica stuff will be spendy, but stellar quality). Not quite true. For instance, the Olympus OM-D EM1 mk2 and the Canon 5DSr and 6Dmk2 both have around 12 stops of dynamic range, not much better than an old 5Dmk2 (10 years old!). Whereas the Sony A7R3 and Nikon D850 have nearly 15 stops of dynamic range. If we think about the fact that most landscape photographers used to have to use up to 3 stops of grad filter to compensate for bright skies, then the extra three stops of dynamic range with the D850/A7R3 means that you can get the same results without using grad filters. For someone shooting climbing, which is essentially landscape photography with a body in it, this is a big bonus. It also means you don't have to have perfect exposure and can underexpose slightly if you're shooting into the sky/sun. As for autofocus - you're right, sometimes you'll be using a small aperture and focus is not as critical (but high ISO dynamic range and noise would be). However, sometimes you'll want to use a small aperture for drop focus and then autofocus needs to be good. By good, I mean the "accurate" side of good, not the "fast" side of good. Just been fondling a few cameras at the airport. As a Fuji user, it seems to me that other makes require far more menu use, whereas with Fuji you can have aperture, shutter speed, exposure compensation and ISO at your fingertips with physical dials. I may be missing something, but it seems to me this is a major consideration in the cold and with gloves and so on. Funny how I’ve not once in 13 years had a discussion about dynamic range with another professional photographer (admittedly I have with regards video). Technically, you’re correct. But ultimately a client isn’t likely to be noticing if that climber is slightly grainy as you’ve had to pull up the shadows. I’d wager that most climbing photography these days is destined only for web/social media use and such things just don’t make any difference at those sizes. It’s an interesting (and no doubt quite squiggly) line that can be drawn between perfectionism and realism! And nobody used to moan about dynamic range in Victorian times either but that's no reason to use 10x8 wet plate cameras for climbing photography. I work with lots of professional landscape photographers and dynamic range is a really important aspect in camera choice. The dynamic range of landscape scenes can be enormous and with little control of lighting when photographing climbing (you can't blast a big flash at most climbers without getting told off a little) then you have to adapt to the situation. I started my landscape photography work with a 5Dmk2 and the difference between that and the A7R3 in terms of dynamic range, especially at higher ISOs is remarkable. The fact that I can now hand hold photos without grads that I used to have use a tripod and multiple grads for and still get a better result is a massive win. A client may not notice that there's some grain but when they can't see any detail in somebodies face or the colour of their new clothing line is skewed because it's sitting in the deep shadows, they just may choose to use another picture (or another photographer). I was chatting with Dave Cuthbertson the other week about how the dynamic range of the D810 had made things so much easier in processing contra lighting situations. We were comparing the results of the older D700 and the new D810 and looking at some A7R3 files. Nadir Khan was saying something similar - having as much DR as possible is very helpful. Then again Cubby got lots of very nice pictures on Fuji Velvia so it depends on the situation. If you don't know what you're up against, a large dynamic range is a good attribute to have in a camera. The good photographer, who is shooting to a brief, wouldn't put a new clothing line in deep shadow. If you're shooting editorially you might have that problem, but certainly not commercially. Hi Reece if you want to get a photographers perspective on the cameras you mentioned, I would look at this guy http://tedforbes.com I subscribe to his channel and in all honesty is probably the best photography channel on youtube. Check out his series on cameras all the latest Mirrorless. For almost everybody high quality photography is no longer a profession but a very expensive if rewarding hobby. I'm not convinced of the benefit of full frame these days unless printing large format exhibition prints to sell, even then a very sharp lens on a crop sensor can allow for good interpolation when large prints are needed. Most images only get displayed on screens, even with high definition high pixel counts don't add much. High quality zoom lenses are very expensive and bulky, on mirrorless systems they defeat one of the main benefits in having a compact body. 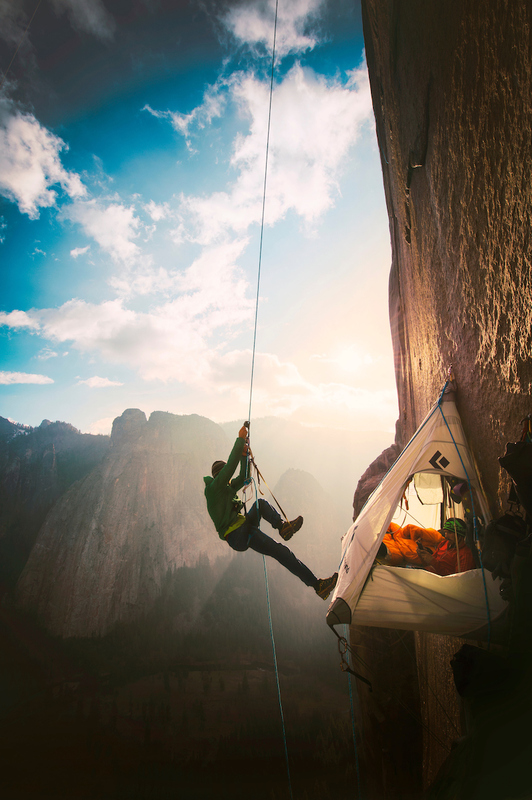 Most of the iconic climbing images from over the years have been taken with prime lenses. This requires some discipline in planning a shot without too many changes of lens but that is the essence of good photography anyway. As has been written above high resolution sensors allows shots to be cropped without noticeable loss of quality. On his site he quotes that Canon 5D MKIII is the current version this is incorrect as going to press. The latest is the EOS R no one wants a sticky shutter in the cold. I've just gone through all the photographs of climbing photographers I could find and nearly all of them are using full frame cameras with zoom lenses. There's a few prime lenses in there but f/2.8 zooms seem to dominate. The reason many historical photos were taken with primes is that the zooms were near universally pretty bad until computers started to design lenses and new coatings allowed many more elements. I agree that smaller sensors can work fine though - there are a few visual compromises but the Olympus cameras for instance are very competent (and the lenses are great!). If you're going to start by going straight into primarily commercial work then I would agree. However, many photo shoots are of climbers 'working' and as such, they call the shots - you adapt to conditions. The sponsor (often clothing manufacturers/retailers) will still want the clothes to look good though. A quick extra for this topic. Many commercial clients will want video content as well as stills content. Unless you can really specialise (which I would suggest most people can't until later in a career or if they have a way of subsidising the process) then being flexible is the order of the day. Not necessarily without the benefit of zoom lenses. Nikon and Canon both had 'OK' zoom lenses (which appeared in the 70s) but you're right, many will have been taken with primes because of the poor quality of the zooms at the time and the lack of a 'faster' aperture. However, I've just checked with Cubby and he says he was using zooms in the late 80s (35-70 and 20-35 for instance). Modern zoom lenses are remarkable though. I have the Sony 24-105, and that zoom range is often considered the Volvo Estate of lenses. However, the Sony version is better than nearly all of the old historic prime lenses I've played with (albeit the primes often have a nicer 'look'). The really classic climbing photographs were taken with a 40lb tailback whole plate camera shooting collodion film on glass plates and having to take the darkroom up with you! If it's pure image quality and if size/cost are secondary go FF. If size and cost are primary at the expense of image quality then go MFT. If it's somewhere in between go APS-C.